Water quality test strips have been around for decades. They are usually constructed from a porous media, including different types of paper, and undergo a color change when dipped into water containing the analyte of interest. These test strips have seen application in swimming pools, aquariums, hot tubs, remediation sites, and other commercial/environmental areas. Common analytes include; pH, hardness, chloride, ammonia, nitrate, nitrite, and metals such as iron, copper, zinc, cadmium, and lead. Strip-based tests offer the advantages of being low cost and providing timely results — all in a simple and portable workflow. Strip-based tests are inferior to traditional laboratory instruments in some areas, especially when it comes to sensitivity and detection limit. However, recent advances in strip-based testing have been made to overcome these limitations while maintaining the existing attractive features of these tests. The latest technology improves the traditional strip-based test through a measurement of color area rather than color change — this is an important advancement as small changes in hue are difficult to detect by the naked eye. New methods have been developed that can deposit and immobilize reagents that undergo color changes in defined test zones on a porous media. An example can be seen in Figure 1, where a water sample is added to the center of a test zone, causing a circular color change that radiates outward with the sample flow. When the analyte is consumed, the color formation stops (but the water continues to flow to the edges of the device). The size of the color change area can be imaged and computer analyzed or simply read with a ruler. The usual run time of these tests is approximately two minutes. Images of copper, zinc, and iron test strips can be seen in Figure 2. Figure 1: The water sample is added to the center of the circular test zone. The area of the red circle that forms is directly proportional to the concentration of zinc in the initial sample. The larger the circle that forms, the higher the concentration of zinc in the water sample. Figure 2: Images of completed copper, zinc, and iron water tests. The area of the circular color change is directly proportional to the concentration of analyte in the water sample. One advantage of these new tests is that a much larger volume (100 µL vs. ~1 µL) of sample water is run through the porous media of the test when compared to a traditional dip test strip. This 100-fold increase in total sample correlates to lower detection limits and improved sensitivity since there is a larger total quantity of analyte. The circular design of these tests leads to the fastest run time, better detection limits, highest sensitivity, and easier image analysis when compared to a linear flow strip. The copper, iron, and zinc versions of these tests can quantify concentration ranges from 100 ppm – 0.05 ppm without requiring any sample concentration or dilution. Another advantage for measuring the area of color change instead of a change of color hue is for image analysis. Measurement errors arising from lighting conditions, camera specifications, and personal bias when measuring an area instead of a hue are much less prevalent. Due to the large number of different camera phones and camera sensors on the market, area image analysis is more reliable than hue analysis across different imaging platforms. 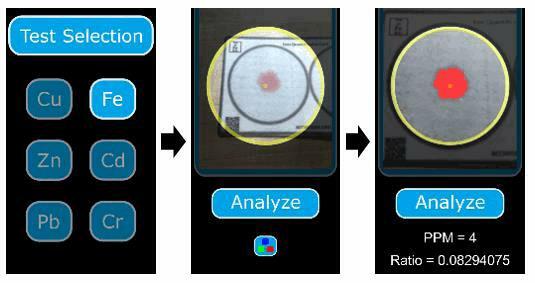 The first companion image analysis app for these circular water tests was released in early 2017. Screenshots from the water test analysis app can be seen in Figure 3. Figure 3: Screenshots of the image analysis app calculating iron concentration in a water sample. A picture is taken with a smartphone and then the concentration is reported on screen. The iron concentration is analyzed by the ratio of pixels that have undergone a color change.